"Aren't you impressed to see so many people gather to hear you speak?" ... "No – because ten times as many would come to see me hanged." If affordability problems are seen as reliability problems, Ontarians should be annoyed by the manner in which NDP Leader Andrea Horwath gives the Liberal government rope. In an effort to achieve these and other goals that will benefit electricity customers, the government plans to move forward with a comprehensive review of the electricity sector and its various agencies. It's a noble sentiment written into the budget, but it's comical that it was read by Dwight Duncan. Maybe not comical. He is the architect of the disaster that is Ontario's Electricity market, and the Pottery Barn rule, 'You break it, you own it,' has been used in stranger circumstances (including the foreign policy implications of invading Iraq). We looked at the old Ontario Hydro model, but that put us $38 billion in debt. Some want to move back to that model. I reject it. I want to move forward. We've looked at moving to a fully competitive market, but couldn't find one that worked…anywhere. We studied other jurisdictions to benchmark best practices. But you know what – there is no "right" way. So we've chosen what we think is the best way. An approach that recognizes the balance between conservation and adequate supply. An approach that recognizes the need to balance public leadership with private investment. An approach that will outlive this Minister and this government. An approach that will begin to make up for over a decade lost in Ontario's electricity sector. That balance has seen a diminishing consumption rate, in large part due to a shrinking manufacturing base, and continual growth in generation capacity. Markets (and there are market options to meet capacity requirements while avoiding the expense of excessive capacity) would be dialing back supply in response to continuing low demand levels. That has been prevented from happening, with the Duncan/McGuinty tandem killing the market in support of their pet projects. ...regulation is "a lot better than to have every political party picking its favorite technology, and either subsidizing the hell out of it with government money or asking the utility to subsidize the hell out of it on customers." 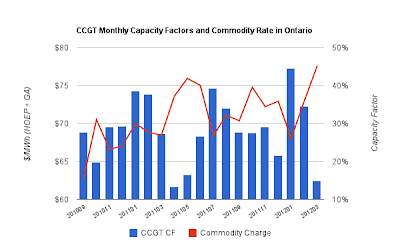 The commodity price of electricity in Ontario is characterized by a collapsing market price (HOEP), and surging global adjustment (GA) costs; the GA is the mechanism to recover the full cost of the government's asinine procurement contracts from the province's complacent ratepayers (industry hasn't been as complacent - much of it left). This week there is an 'industry' meeting in Toronto to plan the exploitation of the government's idiotic feed-in tariff (FIT) program. That program has already contracted 8000MW, of wind and solar capacity, on a must take basis despite it's inability to displace other generation. Consequently, the combined cycle gas generation (CCGT) needed to actually replace coal units could by attained only by offering suppliers net revenue requirement guarantees in their contracts - which are essentially capacity payments, without the efficiency of a capacity market. The result is that the less we use the CCGT capacity contracted by the Liberal government, the more expensive electricity is. 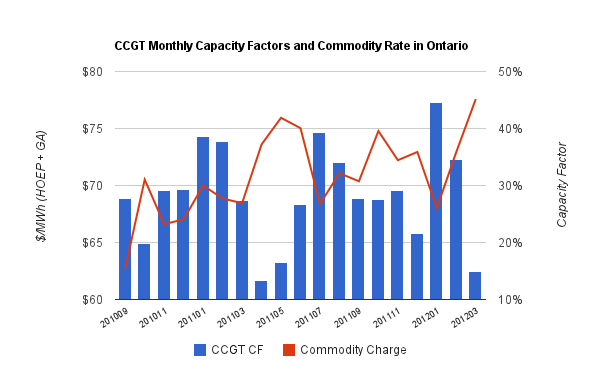 A warm March in 2012 thus spiked the GA to a new record high (estimated at $62.13/MWh), pushing the commodity charge for the bulk of Ontarians up more than 13% over last year. The Global Adjustment mechanism allows for a dysfunctional market, and should be seen as a measure of the market's dysfunction. In adjacent US markets, the price of electricity is being dictated by cheap natural gas, because the marginal, or peaking, supply is usually a fossil fuel, and gas is most suited to be the peaking supply, it is the price gas generators bid into the market at that sets the market price. In Ontario, we guarantee the marginal capacity supplier a capacity fee, and so guarantee an even lower price. As we continue to contract expensive supply on a must take basis, we amplify the trend of lower market prices also being experienced in adjacent US markets, with the Global Adjustment being added back onto Ontario bills more than compensating for the impact of reduced consumption in lowering prices, and instead driving the total commodity rate higher within Ontario. The weekly reporting I display on this website indicates the additional expense we increasingly incur in paying to curtail production. 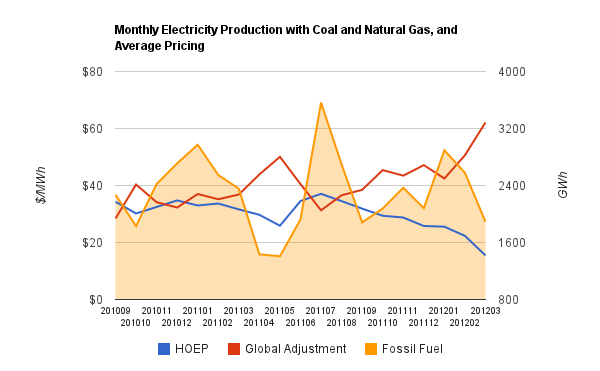 In April, 2011, the commodity charge for electricity in Ontario was $73.60 ($29.71 HOEP, $42.89 GA) -- the first estimate for just the GA portion in April 2012 is $74.68. If the market price is $0 in April, our rates will still go up. Mr. Duncan's 2004 playday creation of a faux market is a complete failure. Ontario's electricity sector is a playground for gluttonous procurement of supply that needlessly devalues the existing assets of the province (2011 revenues from Hydro One and OPG were $107 million below expectations, in large part due to "lower market prices for OPG's unregulated hydro and lower volumes"). Mr. Duncan included in the budget a couple of elements to punish rural Ontario for voting out Liberal members last fall. His embrace of Liberal celebrity economist Don Drummond's bizarre description of slot revenues at Ontairo racetracks as a subsidy allowed one churlish attack, and in the budget the capping of the OCEB (which shouldn't exist to begin with) at 3000MWh per month is a measure to disproportionately punish rural residents with farms, or simply without access to gas for heating. 'Prostitution, horse racing, gambling and electricity are irresistible to politicians"
Like the electricity policies, the attack on farmers will disproportionately punish low income families, as a far greater percentage of their income is spent on food and power. There was a time when regressive measures would be particularly repugnant to the party traditionally on the left of the political spectrum. Ms. Horwath is doing a slow reveal of her conditions to embrace the budget, but none of them is likely to put Ontario's poorer citizens above the Greenpeace agenda that infiltrated the NDP, which prides itself on getting along - not matter how far from it's roots that takes it. The removal of Dwight Duncan from any significant portfolio should be demanded, but it's unlikely to be a price the government will negotiate for the almost certain support she'll capitulate to give anyway. I hope I don't find out what trinket she sells out lower income Ontarians for. The story is seedy enough with the horse racing, gambling and electricity aspects.